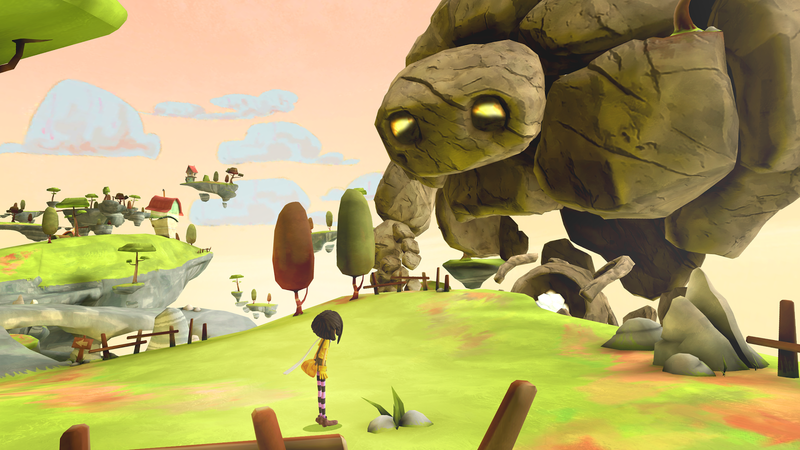 Lola and the Giant is a game developed by Climax Studios. We have spoken with the Business Development manager Josh Trant. In addition, we have gotten the answers to the three question we ask every short article. Tell us more about Lola and the Giant! Lola and the Giant takes you on a fun, exciting and completely unique adventure where you take control of Lola, a little girl with magical powers and the Giant, a huge, rocky behemoth with incredible strength. Each of them has their own unique perspective of the same world, Lola’s is from the ground, seeing things close up and talking with the inhabitants of the world. The Giant’s is from high above, granting you a bird’s eye view to see the layout of the world and the puzzles you will face. The core experience of the game sees you using these two unique perspectives and their individual powers in combination to overcome and solve the game’s puzzles. Lola and the Giant is set in a beautiful, charming and visually stunning world that is heavily influenced by childhood and the imaginations of children. Lola’s world is a fun and creative representation of Lola’s inner thoughts and memories crashing together and creating things that have never been seen before. All of the characters that Lola encounters throughout her adventure are crazy combinations of real-world creatures. There are Frabbits, a cross between a Frog and Rabbit right through to the Flippo’s, which cross a fish with a hippopotamus. The environments themselves are filled with references to childhood, from houses with wind up keys protruding from the walls to an encounter with a magical music box and its toy dancers. The world we created for Lola and the Giant is unique, imaginative and full of creativity. Lola and the Giant’s core gameplay experience of switching between Lola’s and the Giant’s perspectives and using them to solve puzzles is a feature that pushes Lola apart from the competition. The switching perspectives between Lola and the Giant allows us to craft unique puzzles for players to solve. One such puzzles sees Lola and the Giant arrive into a small village whose Great Statue has vanished. As Lola, players will speak to the inhabitants and come to learn that a trio of animal statues are the key to restoring the Great Statue. The Giant, from his elevated perspective, can see the three animal statues, pick them up, rotate them and move them around. However, he has no idea what to do with them. Lola then finds a small island at the back of the village that the Giant cannot see from his perspective. There on the island is a smaller, model-like replica of the animal statues that the Giant can see and manipulate. Players must switch back and forth between their perspectives to work out the correct positions and rotations of the statues, using Lola to see the solution and the Giant to implement it. Visually, I believe you would struggle to find another mobile VR game that looks as good as Lola and the Giant. We pushed the mobile platform to its very limit with the visuals, creating a game that was full of character. From the amazing characters to the stunning vistas, Lola and the Giant is a benchmark in what can be achieved in mobile VR. Lola and the Giant also features a unique co-operative mode whereby players in non-VR can download a companion application to their mobile phone or tablet and join in with the VR players. In companion mode, they are given their own window into the world of Lola and the Giant, able to follow the VR player and even help them along the way. Companion app users can place hint arrows down in the world that appears within the VR world and help guide players or show them things they may have missed. The companion app was a key part of the Lola experience as it makes VR a social experience and not an isolated one. Everyone can gather around a phone or tablet and go on the adventure with the VR player. With the minimum age for VR on Daydream being 13 years old, the companion app became an essential part of Lola and the Giant, as the game is in many ways a love letter to my daughter, she is able to experience it and see all of the influences she has on it, all through the companion application on a phone or tablet. The before mentioned Great Statue puzzle is also a good example of how the companion application creates social co-operation between the VR player and those using the companion application. The users of the companion application can remain seeing from Lola’s perspective whilst the VR player switches to the Giant. They can then call out the solution to the puzzle, creating instant co-operative gameplay. Lola and the Giant is fantastic VR experience, taking players on a narrative journey full of humor, memorable characters, amazing places and in the end, delivering an adventure that will stay with them long after. In addition, with the companion application, we have created something that sits completely uniquely within the VR landscape, taking mobile VR from an isolated experience and transforming it into a social one. Hence, the award ceremony is coming closer and closer, we ask you to not forget to vote once again! Also, if you want to be fully part of this year’s IMGA get your tickets and come!